German postcard celebrating "the great German victory over the English" off Jutland, May 31, 1916. 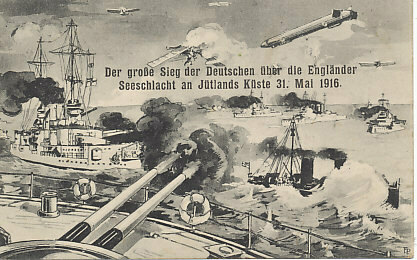 The Battle of Jutland (or of the Skagerrak) was the largest naval engagement of the war. Although, as on this card, the Germans declared victory, the outcome was less clear, and the German surface fleet did not again contest British control of the North Sea. Germany's grand plan for 1916 was to drive France from the war by beseiging Verdun, and to starve Britain by resuming unrestricted submarine warfare. When Germany did not go ahead with its submarine campaign, the Kaiser replaced the command of the Imperial Navy on March 15. The new commander began planning to strike Britain. The German command developed a plan to entice the main British fleet to battle. A small decoy fleet would lead the British fleet towards the main German fleet. The British knew of the plans, for they had been given the German codes by the Russians, who had found them on the body of a German naval officer in the Baltic. They planned a mirror to the German plan, with a smaller fleet pursuing the Germans ships, then leading them toward the main British fleet. The British put to sea on May 30, the primary British fleet to the north, the decoy with five ships to the south. The next day, on May 31, the German forces put to sea, its decoy with six ships. The forces met west of the Jutland Peninsula and the Skaggerak at approximately 3:30 in the afternoon. The German decoy was first to see its counterpart, and turned south towards the main German fleet, the British in pursuit. Within minutes the decoys exchanged fire, and the Germans sank two British ships. More than an hour into the battle, the British decoy sighted the main German fleet, and turned east to draw it towards the British fleet. It was after 6:00 PM when both fleets were fully engaged. The Germans sank another British battleship and the British began to inflict some damage on the German fleet. Laying down smokescreens, the Germans began evasive movements to return to port. Although the smaller British fleet again found the German ships, the larger did not. 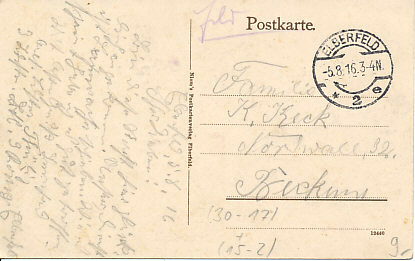 The Germans lost two ships in the battle, but returned safely to port. The British lost 6,097 men, the Germans 2,551.